Type and Use: Perennial with seeds that can be used in breads and cookies. Good salt substitute. Use like celery. Harvest Time: Harvest leaves any time. Will freeze well, and can be dried. Pick leaves just before bloom. Dig roots in the fall. 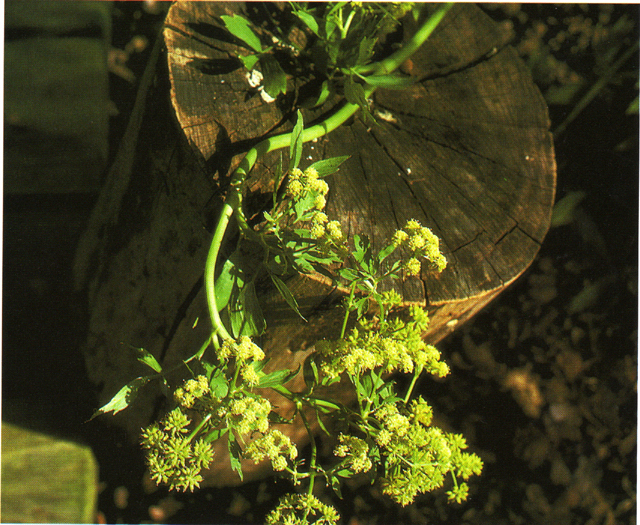 Growth Habits: Umbels of small yellow-green flowers followed by many aromatic seeds. Large dark-green leaves, celery-scented leaves and yellow stems. Culture: Easy to grow in any well drained soil. Use like celery. Use seeds in breads. Stems, seeds and large, parsley-like leaves have a pungent celery flavor. Plant is totally winter-hardy. With glossy, deep-green leaves that are cut and divided, and somewhat flat clusters of greenish-yellow flowers. It likes a rich soil with plenty of humus. Troubles and Solutions: Cutworms, caterpillars, hot weather, and afternoon sun will burn plants. Harvest and Storage: Good to nibble on fresh out of the garden. Chew on the seed when they turn brown. Notes: Cook with cabbage and use the leaves fresh but cook the stalks.